It was our first year anniversary and I am thinking of doing something special for my hubby. At first, I decided to surprise him with a dinner in a restaurant. I tried to call Sheridan Hotel here in Iloilo in order to ask if they do romantic dinner for two. They said they can do it in a hut near their infinity pool. I describe to them what I wanted to happen. I told them that I wanted the place to be private. I even asked them to scatter petals of roses around the table and of course few candles to make it more romantic. I am already convinced to do it on our anniversary day. Their cuisine is also alluring that really fits for a romantic dinner yet my plan wasn’t pursued due to some reasons. Therefore I kept on thinking of other ways in order to delight my hubby. 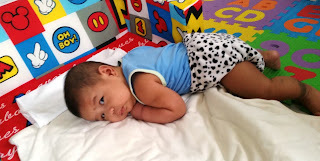 Going out on our anniversary day was not an option anymore since I can’t leave my baby at home even if he has his nanny. So I thought of ways on how to surprise him at home… I suddenly remember his favorite pasta, the baked lasagna. I haven’t tried making one but I am willing to try and give the best of it since I know that it will surely impress my hubby. Hence, I searched for a recipe that I can just easily follow. 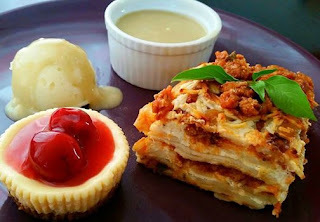 I got my recipe for baked lasagna in http://panlasangpinoy.com/. Their recipe is easy yet very delicious. When my hubby tasted it, he really said that it is indeed his favorite Italian casserole dish. After baking lasagna, I thought of serving it in a special way. I served it in a plate of love composed of mashed potato as a side dish, red ruby cherry cheesecake as the dessert and the best Italian dish baked by yours truly, lasagna. Bake yours now! It will surely amaze your loved ones. That looks delicious! I love making lasagna for my family. I'd like to try your recipe. That would be a perfect dish for my husband, he loves lasagna! Three lbs of cheese is a lot though. Panlasang Pinoy is our go-to site when we want to cook something delicious. Will definitely try this one, i love lasagna! Love the presentation. Happy Anniversary to you and your hubby. God bless your family. Happy Anniversary! I think that you preparing something for your loved one is more romantic to be honest. I have not tried making lasagna, I'm scared of that pasta LOL. I go to panlasangpinoy as well. That's where I learned how to cook a handful of our dishes. Happy 1st Anniversary to both of you I am sure your partner did cherish what you've made for him. So sweet of you naman making your hubby's fave dish. I know so happy siya on what you have prepared. seems a good dish too.